German Engineer. Chief pilot at Messerschmitt, technical designer of the surface-to-air missile Enzian. Studied aviation engineering 1926-1933 in Munich and Stuttgart, receiving doctorate. 1933-1935 lead designer at the German Aviation Research Institute in Berlin. 1935-1936 test pilot for the Luftwaffe at Rechlin. 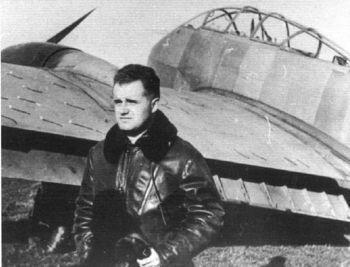 1936-1943 chief test pilot for Messerschmitt at Augsburg. Led testing of the Me-109, the most successful German fighter of World War II. Set a world speed record in a modified Me-109 on 11 November 1937. Director of development of the Enzian surface-to-air missile 1943-1945. After the war founded a building materials business in Noerdlingen. 1907 September 25 - . Birth of Hermann Wurster. - . Related Persons: Wurster, Hermann. German Engineer. Chief pilot at Messerschmitt, technical designer of the surface-to-air missile Enzian..
1985 October 17 - . Death of Hermann Wurster. - . Related Persons: Wurster, Hermann. German Engineer. Chief pilot at Messerschmitt, technical designer of the surface-to-air missile Enzian..